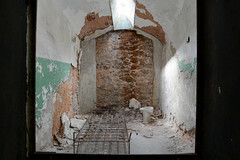 New York State built Greycourt Prison on a 300 plus acre site in 1918 to incarcerate female convicts. 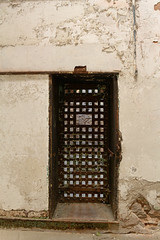 However, the jail only housed a prison population until 1934. After that, it was taken over by New York City as a farm colony for the poor and homeless of the Great Depression. Prior to safety net programs like social security, disability and Section 8 housing, Farm Colonies were a popular housing model for many state and local governments to provide a self-sustaining, therapeutic environment for the destitute or mentally disabled. 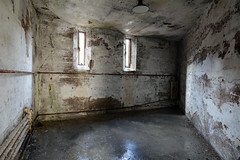 The former prison was renamed Camp LaGuardia in 1935 to reflect repurposing of the facility. New York City’s homeless would be bused 65 miles north of the city to the 1,001-bed facility in the evening. Early in the camp’s history the residents would work the farm or find employment at one of the nearby Jewish resorts. While the “camp” originally housed working indigent men, that demographics changed in the latter part of the last century as the homeless population began to consist more of younger drug addicted and/or mentally ill males. The more recent population gained a negative reputation after incidents involving the community including, public urination, the strangulation of a local’s pet rabbit and others. Prompted in part by the changing demographics of the camp, as well as, the aforementioned incidents, local opposition to the facility grew throughout the 1980s until its closing. In 2007 the Bloomberg administration began moving camp residents to subsidized housing or other shelters in preparation for the decommissioning. The facility was closed in 2008 and the buildings have remained empty since. The most recent news on the property indicates that the site is being cleaned up and marketed for commercial redevelopment by the county. The former women’s prison turned homeless shelter had few artifacts or ephemera; however, it has some interesting architecture and was exciting to explore due to a couple of near run-ins. Before we were finished wandering around, we had to hide from a couple of locals. Note, normally meeting the locals isn’t a concern regardless of location but this place had kind of a deliverance vibe. Also, be warned, if you seek this place out and pay it a visit, it is patrolled. Gallery | This entry was posted in Hospitals & Institutions, New York, Uncategorized and tagged Abandoned, Architecture, Creepy, exploration, History, homeless shelter, institution, jail, New York, Photography, prison, ruin, ruined, Ruins, UE, Urban Exploring, Urbex. Bookmark the permalink.